Not Receiving Some Expected Emails From Specific Senders in Outlook? "I use Outlook 2010 and my emailing system works smoothly. Although I receive emails from everyone within the organization, there is a team member who sends me a message but I do not get it and this problem is with the specific sender. What should I do to troubleshoot?" The problem shared above is quite complex and many would suggest you to directly contact to the ISP provider to troubleshoot. However, before that it is recommended to follow the work around mentioned below to fix the problem of not receiving emails from specific sender. 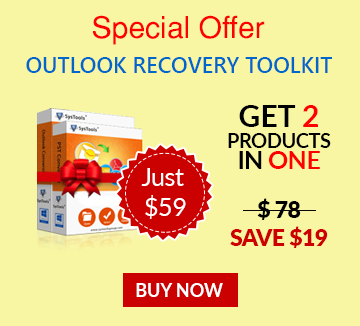 In many cases, Outlook® may mark an e-mail suspicious and move it to the junk e-mail folder. Therefore, if the e-mail is sent multiple times from an address but you haven't received it in your inbox, then possibility is it has been moved to the junk mail folder. So the first step is to check this folder to ensure if the application is marking mail from the sender as spam. May be you get the solution in first step! If a virus scanner or anti-spam tool is integrated with MS Outlook, then possibility is it is causing hindrance in receiving emails. To test if the scanner is causing the problem, disable it for some time and then ask the sender to send the mail again. If it works that means you know what the problem is. If you have installed some third party anti-spam tool, then check its documentation to find out what is actually does when it considers a mail as spam and find out how its integration with MS Outlook can be disabled. If the same account is configured on multiple devices like laptop, tablet, mobile phone etc, then check out if the message is getting downloaded on those devices. If they arrive to the inbox of other apps, then clearly the problem is related to current profile. In that case, creating a new profile might help. Also, if a POP3 account is used, then make sure that you enable the 'leave a copy on the server' option so that all devices can successfully collect the mails. If multiple rules are applied for sending or receiving emails, then possibility is that the mail is getting moved to a different folder or even deleted. Check out all the sub folders to ensure that the message that specific address is not passed to any other folder. For assurance, you can delete all the rules and then check if the problem persists. If the email address is added to the list, select it and click on 'Remove' button. Now, when you have checked that nothing on the system is interrupting or restricting access to the mail from that specific sender, it's the time to check the email existence on web mail account. If you have an Exchange account, then Outlook Web Access can be used to check mail availability to mailbox. If you are using POP3 mail account and the mail is arriving on the web mailbox, then possibility is that you have corrupt Outlook profile or there are some synchronization issues. Moreover, check the junk-email properties. It is possible that if a mail is filtered as spam on web, it is restricted to be downloaded to Outlook. Check out mail filter settings at server level and correct it if needed. If a message is large in size and the server timeout is very small, then possibility is that the message remain stuck in outbox and does not reach to desired address. Another probable reason is that there is something wrong with SMTP authentication or issues with the outgoing mail server. Wrong E-mail Address: The sender has added an incorrect email address and thus the mail have bounced. Server on Black List: Possibility is that the sending mail server is added to the black list. In that case, contact your ISP or the mail admin. Note: The NDR message can arrive in the inbox, junk mail folder, or even to the deleted items folder. If still the problem is not solved, then the problem is associated with the mail server. In that case, you should make a contact with the Internet Service Provider or the email administrator to get the problem solved. While you perform all above tests to check the problem, collect their results so that it can help them to trace the actual issue.